The Giant Magellan Telescope (GMT)- the product of more than a century of astronomical research and telescope-building by some of the world's leading research institutions - will open a new window on the universe for the 21st century. Scheduled for completion around 2018, the GMT will have the resolving power of a 24.5-meter (80 foot) primary mirror-far larger than any other telescope ever built. It will answer many of the questions at the forefront of astrophysics today and will pose new and unanticipated riddles for future generations of astronomers. The GMT will produce images up to 10 times sharper than the Hubble Space Telescope. The principal measure of the power of an optical/IR telescope is the diameter of its primary aperture. Larger apertures translate into both greater light collecting area and, potentially, higher angular resolution. 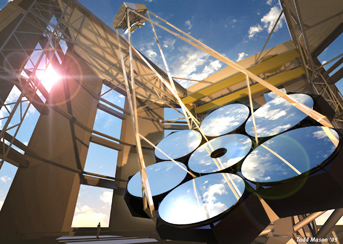 GMT's primary mirror is comprised of seven segments that work together like a single mirror with the resolving power of a telescope 24.5 meters in diameter. Each of GMT's seven mirror segments is 8.4-meters in diameter. The limitation of the size of a single mirror segment is related to the technology available to manufacture and transport such a mirror. GMT's 8.4m mirror segments are being developed at the University of Arizona's Steward Observatory Mirror Lab. The mirrors are made of low expansion glass molded into a light-weight honeycomb structure. The mirror segments are ground and polished to a precise optical prescription. The final polished surface departs from the desired shape by no more than 1/20 a wavelength of green light, or approximately 25 nanometers. After polishing the surface is coated with a thin layer of aluminum to achieve maximum reflectivity. One of the mirror segments is mounted at the center axis of the telescope. The other six mirrors are mounted surrounding the center mirror segment. Each mirror segment is mounted into its own "cell," a complex active support system that keeps the mirror in the proper position relative to the other segments at all times. The most challenging aspect of making the GMT's mirror segments arises from the asymmetric shape of the six outer segments. These mirrors have a steeply curved shape similar to that of a potato chip. The outer edge of these segments are a full 14mm thicker than the inner most edge. A new suite of test instruments and procedures had to be developed to test these mirrors.